Mini Wreath Ornament is an original crochet pattern by June Gilbank. 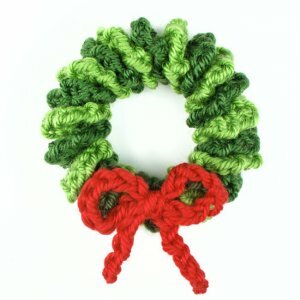 This sweet little pattern lets you make surprisingly realistic leafy miniature wreaths - at only 3" across, they'd be perfect as Christmas Tree ornaments or seasonal decorations. A Mini Wreath works up in no time and comes together like magic with almost no sewing required - you won't be able to stop at making one! Make them in leafy greens, or any pair of colours to match your holiday decor. Send me a donation and receive the easy-to-print PDF version of the pattern as a thank you! The PDF also includes additional assembly photos that you'll only find in the PDF version. Date Added: 12/12/2014 by REBECCA J. Date Added: 10/30/2014 by Joanna D.
Well written pattern works up quickly! Also cute made in school colors for teachers or coworkers. Date Added: 12/05/2013 by Karen A. Date Added: 11/30/2013 by Heather L.